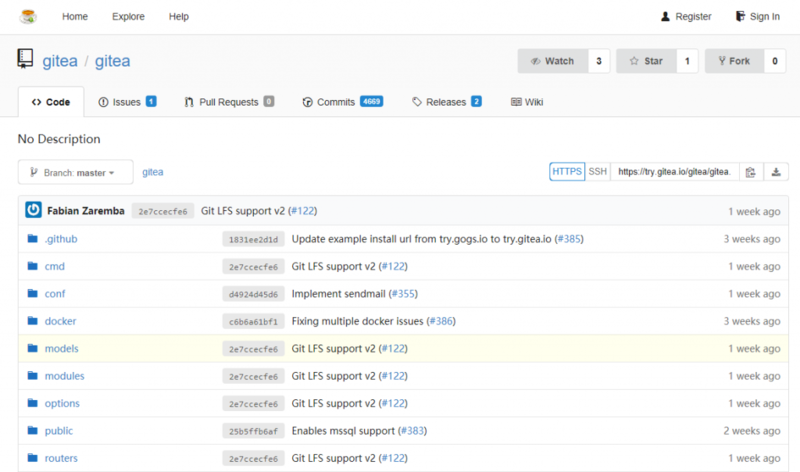 Gitea is a self-hosted Git service forked from Gogs. It’s very easy to deploy and has a low system usage impact. In this howto, we will use SQLite as the database backend and the Gitea binary (as there is no Debian package available at this time). This howto is based on Debian Jessie. But it should work with Debian Stretch (alias testing). To be able to run Gitea on Debian you will need a local user without root rights and the git package. Open a webpage in your browser using the IP of your server on the TCP port 3000 (by example : 192.168.1.200:3000) and complete all the information asked by Gitea. Your configuration file will be in the “custom/conf/” directory on the “app.ini” file. You can find the standard configuration file here if you want to check what you can change. If you want to change some advanced settings, you’ll want to read the “Configuration Cheat Sheet“. To be able to run Gitea as a service, we will use Supervisor. In this case, Nginx will be configured to allow the Let’s Encrypt server to get the challenge file in the “/.well-known/acme-challenge” directory. To do that, you will have to create the following directory : “/var/www/git” and give Nginx the right to read files on it. Then you will have to install certbot. You can find it in Debian Backports. SSH avoid "Connection reset by peer"
Copyright © 2019 Jérémy Verda's IT Blog. All Rights Reserved.